Probably not the most common destination in Europe but surely a beautiful city, Bratislava is the capital of Slovakia. It is popular as a stag destination but also has a picturesque old town that is well worth a visit. Amongst the touristy restaurants in the Old town we found a little gem that deserves to be talked about. I got attracted by a sign saying "Moods. Food. Wine. Joy". As it sounded like my life motto I felt like visiting this place. It is located in a narrow cobbled-stone street off one of the main streets. 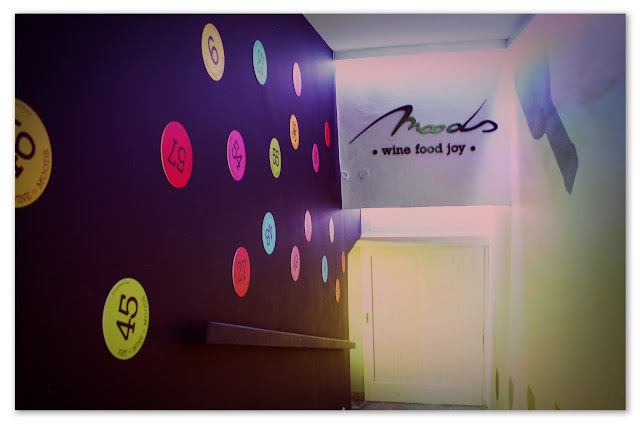 You go down to the basement to find a modern and spacious wine bar/restaurant on 2 different levels. Bottles of wine and design objects reflect the wine theme. It is decorated with taste and attention to details. I was impressed straight away. The waitress was smiley, friendly and enthusiastic. She was kind enough to translate the menu explaining the place was recently opened and didn't have an English menu yet. They have five main dishes, each one corresponding to a recommended house wine. The dishes vary in price from €7.90 for the Roast pork neck, stewing apples and Bavarian dumplings to €15.90 for the Beef tenderloin with plum chutney pancake stuffed with goat cheese. 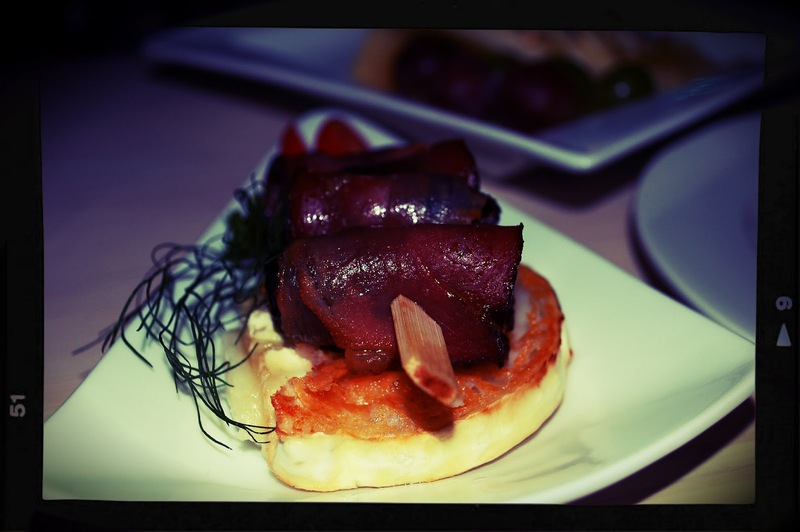 They have a choice of appetisers/tapas that are also good value, presented beautifully and made with quality products. Prices start at €2.00 for rillettes up to €5.90 for Pork tenderloin with zucchini or marinated sirloin with a mustard dressing for example. 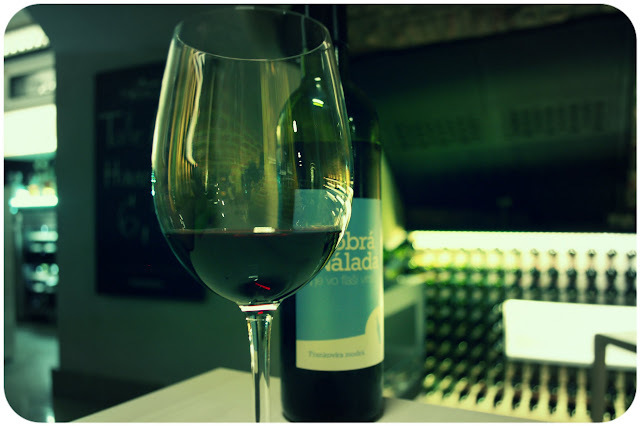 We decided to order their house wine to try Slovak wine, the waitress brought their Dobrá nálada Blaufränkisch 2011 (€8.90) described as an "elegant wine with high tannin content in the full aroma is dominated by ripe cherry and cinnamon flavors-spicy notes". To accompany this lovely wine, we ordered a nice plate of local cheeses (€6.90), the Oškvarkové rillettes served on baguette (€2.00) and the marinated goat cheese with plums wrapped in bacon (€3.20). The food was great, it looked good and it tasted beautiful. We ate to the beautiful sound of piano and double bass played live in a corner of the restaurant. 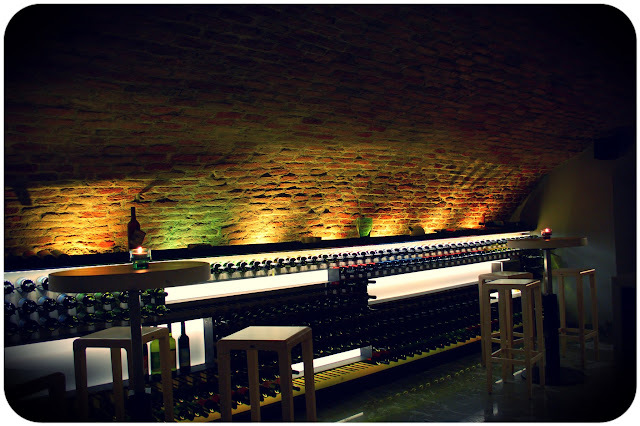 The place downstairs looks like a wine cellar with changing light colours, making a very romantic setting. I definitely fell in love with this place. The decor, service, food and wine ticked all the boxes. It looked trendy but was actually a bargain compared to the prices we pay in Dublin. I highly recommend this little gem if you're ever in Bratislava!